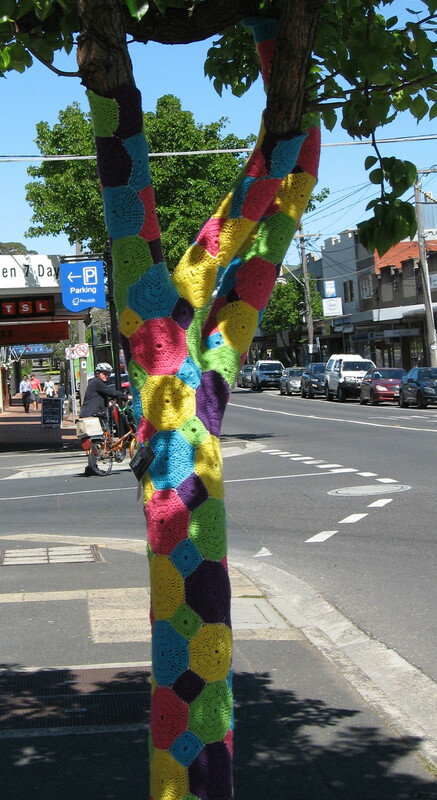 Yarn bombing and guerrilla knitting can be cool. Our suburb was recently bombed overnight and the outcome is fantastic. There are various forms of bombing. I’ve seen lace around trees, crochet and knitted objects surrounding parking meters and road signs. I give this its own street art category of yarn-bombing. This entry was posted in Crochet, StreetArt, Textiles and tagged #GuerillaKnitting, #StreetArt, #UrbanArt, #YarnBombing. Bookmark the permalink.